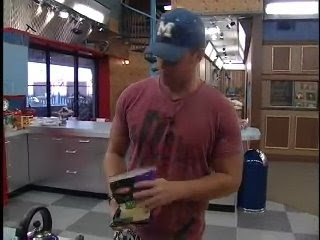 Big Brother Gossip: Cooking time with Memphis. Earlier tonight I looked in on the house and I really hadn't missed much I see. When I left everyone was sleeping and Dan had left. 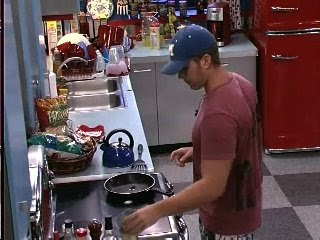 When I returned Keesha and Jerry were sleeping and Memphis was cooking a 'little' four egg omelet for himself. If you want to make your own you can follow the recipe as I watched him make it. 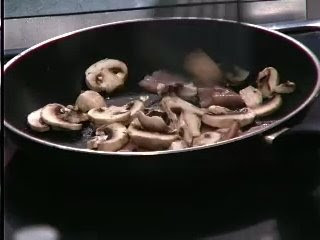 Remove the Mushrooms and Meat from the pan and set aside. 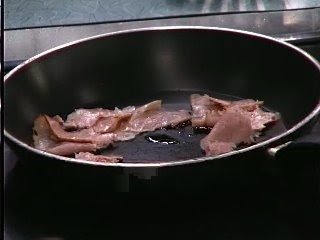 Add some more oil to the pan and then pour in the eggs.. 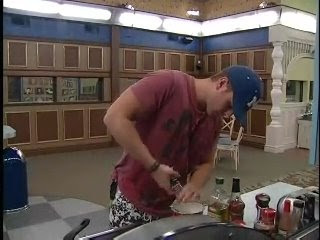 Allow to simmer a bit and I think you then add some cheese - but at this point the camera guy apparently lost interest. 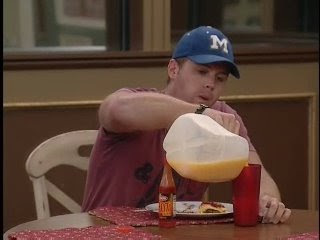 Drink some OJ while you wait for the eggs and cheese to finish. 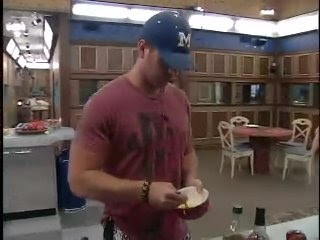 Ahh wait - AFTER the OJ you add the cheese - camera guy back on duty. Put in the mushroom & meat and a bit more cheese for good measure. 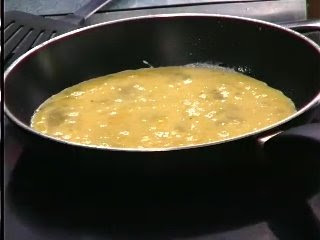 Plate the omelet and immediately wash the pan (oh yes he did). 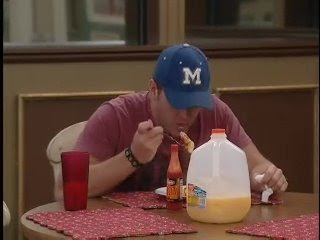 I believe he topped the omelet with jalapenos - it was something green from the fridge. Hot sauce a plenty as well. Now - you have four minutes - that is right - four minutes - to finish the whole thing (I timed it) - you can have a second glass of OJ if you need it. Put your plate in the sink and go outside and digest. You had me at "sit alone outside". 4 eggs? Big boy omelet, right there. Great recipe, complete with 4-minute ingestion. I was getting into it and then the camera guys stopped paying attention - two feeds were on a sleeping Keesha and one on Jerry asleep. Memphis is walking out of frame but I had committed myself to watch the whole process. You could almost hear those young arteries getting harder. No milk? I usually add milk? Are you sure you didn't miss the milk-adding stage? yea. 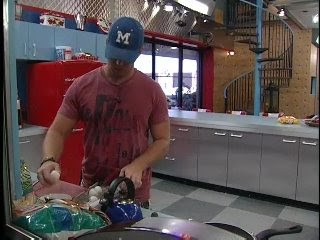 watch memphis cook his omelet. he might have snuck in a little milk there.... but I didn't see it - and I was counting the eggs! OMG... i don't know if you are serious or joking - but if you think I am lame for noting this whole incident - how lame is it for you to be coming here - reading about it - AND commenting? I got a chuckle out of your commentary. I would have washed the pan right afterwards, too. I'm sure it was tasty, but heartburn and then regret would kick in if I ate that. At least I'm finally beginning a new book I've been meaning to read.